Our accommodation in Snowdonia National Park, near Barmouth and Dolgellau, North Wales is in an exceptional location. Overlooking the Mawddach Estuary, one of the most beautiful in Wales, the views are breathtaking. Step straight onto the scenic Mawddach cycle Trail from our camping field. The mountains are all around, with sandy beaches, castles, steam trains, zip lines and bike trails close by. 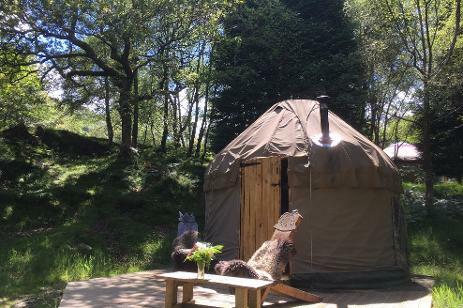 Whether you prefer a cosy yurt, cottage, B & B or camping under the stars, Graig Wen offers a range of quality accommodation. Perfect for a romantic retreat or family adventure – our yurts, Welsh Caban and bell tent are cosy whatever the weather. We welcome well behaved dogs too. 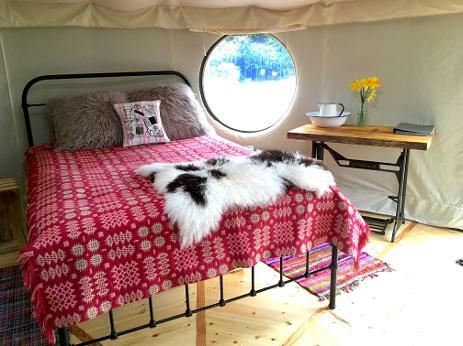 We are open for glamping from March until January, so guests can choose from wild glamping in the woods in summer or winter glamping closer to facilities. Graig Wen features in the Cool Camping guide to exceptional camp sites and has been recommended as one of Britain's Best Glamp Sites in The Guardian and other national media. We have been running for 10 years and are proud to have won the 2016 North Wales Tourism Award for Best Camp Site and a Green Snowdonia Award for Most Sustainable Camp Site. Our glamping guests are blown away by the tranquility and scenery of the Mawddach estuary and Snowdonia mountains as well as the many activities and attractions nearby.